Please call for pricing. Free Shipping. Citrine, a Quartz, is a 7.0 on the Mohs scale and comes from Brazil, Russia, France, and Madagascar. 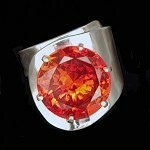 The natural colors range from pale yellow, to pale orange, but the heat treated Citrine is dark, orange brown to reddish brown. Some Citrine is heat treated Amethyst. 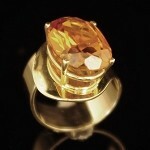 Citrine is the Birthstone for November. Citrine has a good influence on the nervous system and aids in concentration. It combats stress, depression and stimulates liver, stomach, and pancreas functions. It detoxifies and has a positive influence metabolism and also strengthens the immune system. 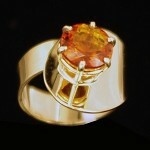 Citrine is very durable and is good for everyday wear. Clean by gently scrubbing with a designated soft “baby” toothbrush and mild dish soap (not lemon scented) and warm water or in an ultrasonic cleaner.